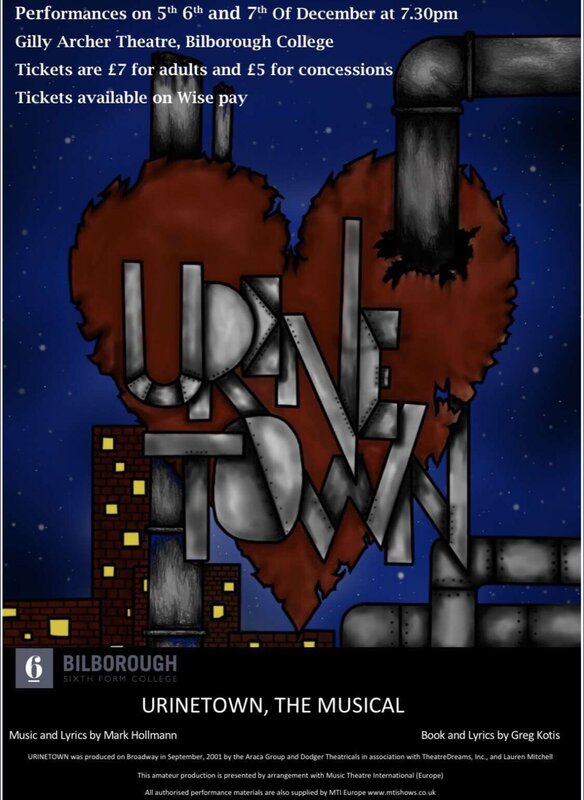 Review: Urinetown the musical. Bilborough College Nottingham. – East Midlands Theatre. 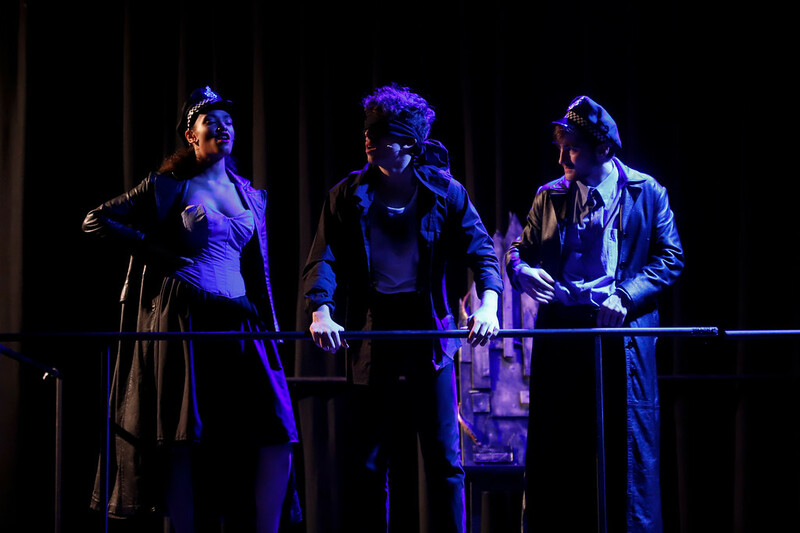 Review: Urinetown the musical. Bilborough College Nottingham. Urinetown the Musical. Now there’s a name to contemplate. Are the creators Mark Hollman and Greg Kotis taking the P? Well actually the premise of the show is very strongly connected with that notion or even motion. Not just taking the P but Urinetown the Musical is about taking away the public rights to a free pee in a not so distant future. Failure to urinate or defecate anywhere but the assigned and guarded public facilities, with a set fee for doing so, after a catastrophic water drought can will lead to a terrible imprisonment in a hellish place called Urinetown. The idea is so distressing that the poor people don’t even know what or where Urinetown is. They just fear it abjectly. 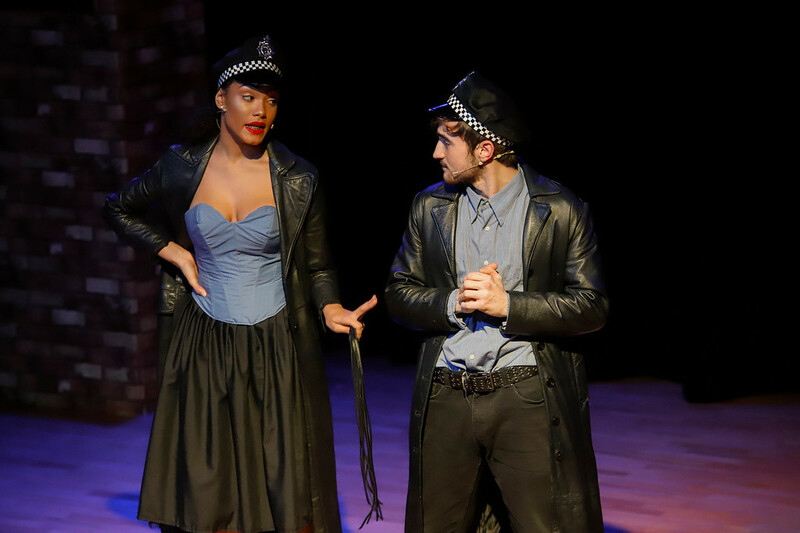 There is another small p in this musical drama that plays a big part in the story telling – the small p of politics – the politics of a cruel megalomaniac business monopoly called Urine Good Company and yet another p standing for the policing of the people. Ones’ pees and queues never ever got so fatal or indeed so cripplingly expensive. And the price is hiking up as we sit in our seats! Hold on to your bladders folks! 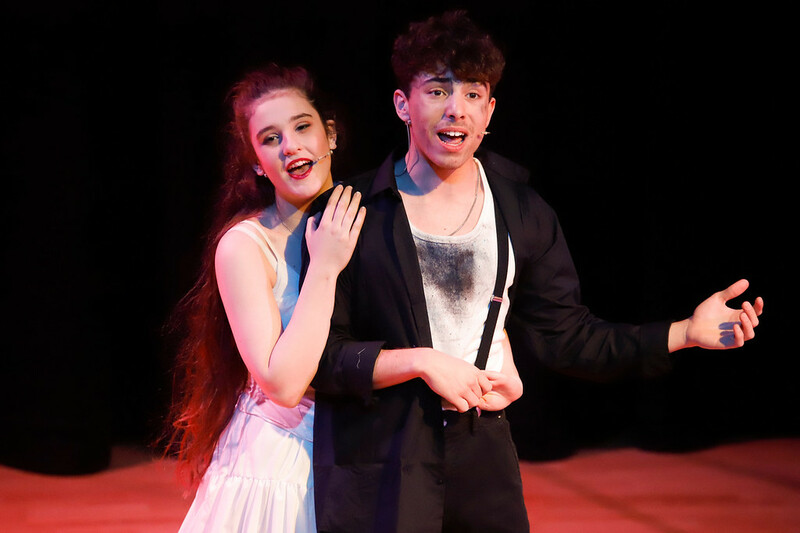 The Tony Award winning show is very meta in its construct, regularly self referencing and alludes to and demonstrates musical theatre ideas as well as a Brechtian style of breaking down the fourth wall and talking very directly to the audience. In fact the fourth wall is so not there one can’t even pee against it. It’s probably a good job as nobody wants a smelly wet legged audience combined with hot stage lights. 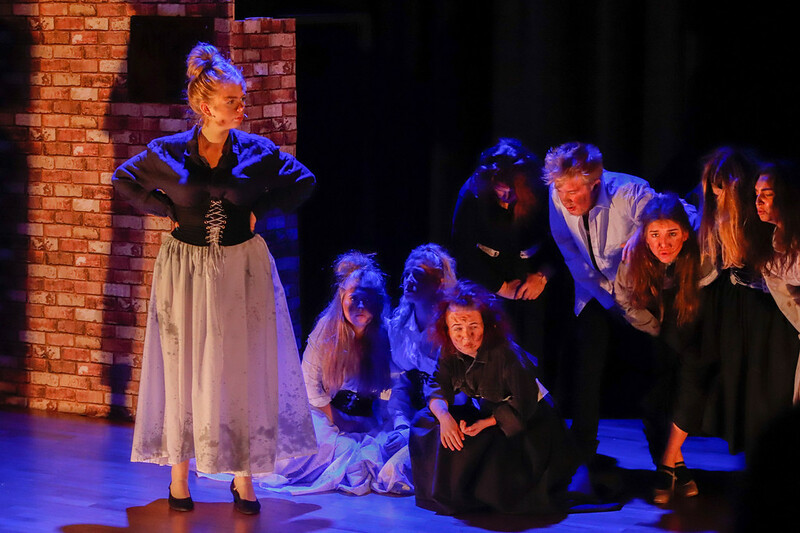 Darkly reductive humour and irony are the key notes of the performance style and the Nottingham Bilborough College, Gilly Archer Studio 6th Form theatre students are around the age where they are able to carry off what is a very adult piece. And they do so with much delightful élan and quite a few knowing interpretive nods. 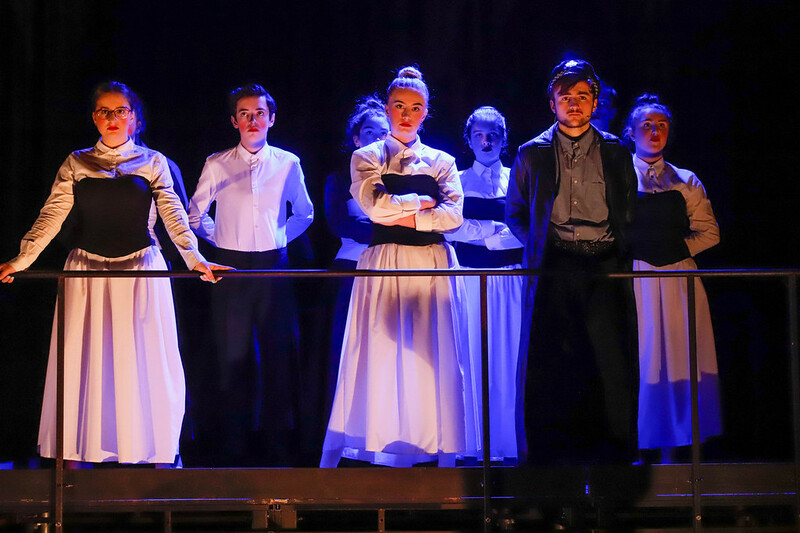 Inventively directed by Izzie Gatford Ball and Sam Hamilton and slickly choreographed by Luke Rouse the show moves from style to style with confidence and overall the piece is very well sung with particular emphasis on the dynamic choral work of the ensemble. 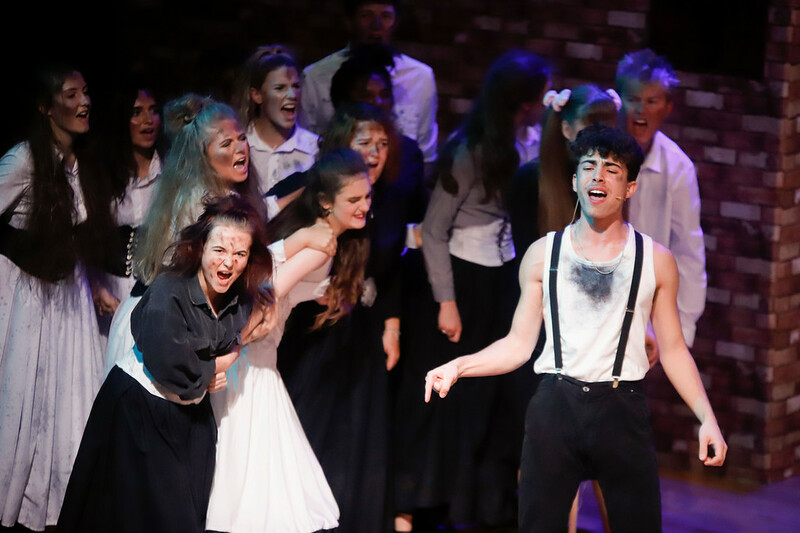 We would say that none of the songs are especially well known outside of the genre of musical theatre and its aficionados, but each fine rendition here carries its weight vocally and shifts the rather abstract story along efficiently and often with some pizazz. It is musically directed by students Jack Bratby and Will Huxtable and utilises a very competent five piece band. 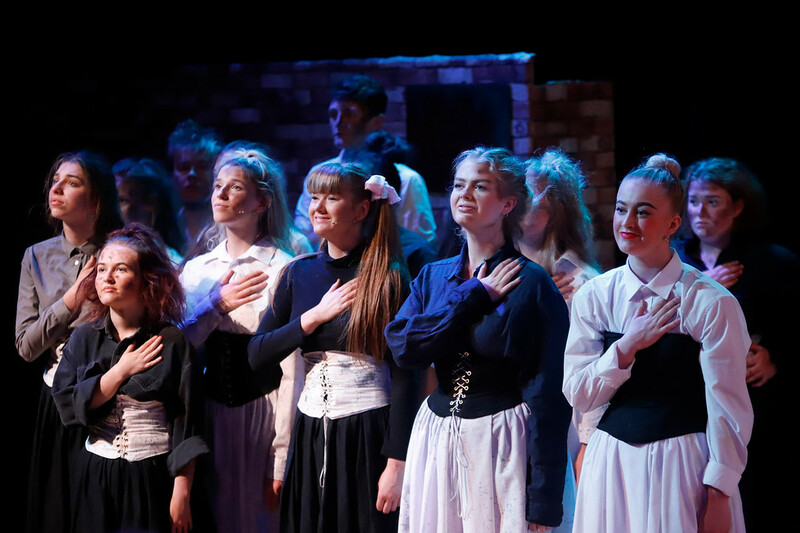 Outstanding acting and vocal performances are given by Edward Turner (Bobby Strong), Emily Wilkins (Hope Cladwell), Fiona Kinsella (Penelope Pennywise), Lydia Messam (Officer Lockstock), Ellie Mai Jackson (Caldwell B Cladwell). For insidious comedy George Le Blond James carries off the role of Officer Barrel with self aggrandising aplomb. 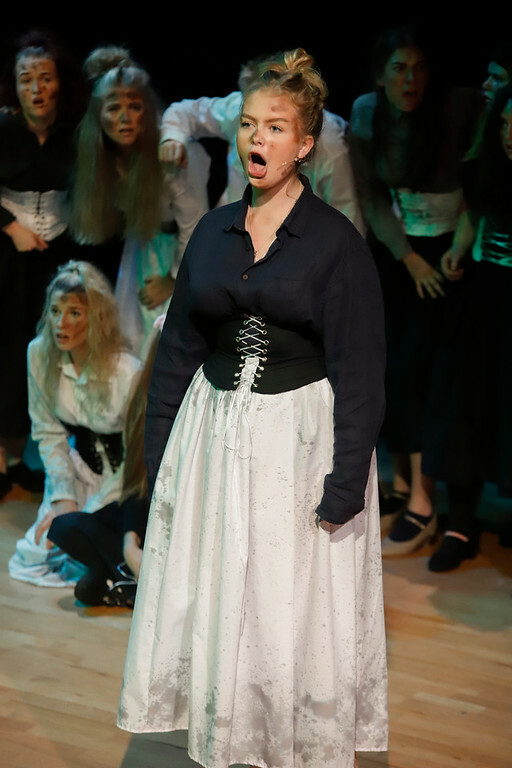 Little Sally (Eleanor Carty) seems a small and unimportant role in the musical’s initial stages but Carty’s prescience in interpreting the script helps this tiny, pigtailed, seemingly innocent girl character become a big player in the bizarre storyline. Nothing too much is given away along the route and as Officer Lockstock says in the very first scene “Nothing can kill a show like too much exposition.” The twists and turns through a variety of musical genres, dancing and playing styles helps keep this unusual musical from ever being irksome. 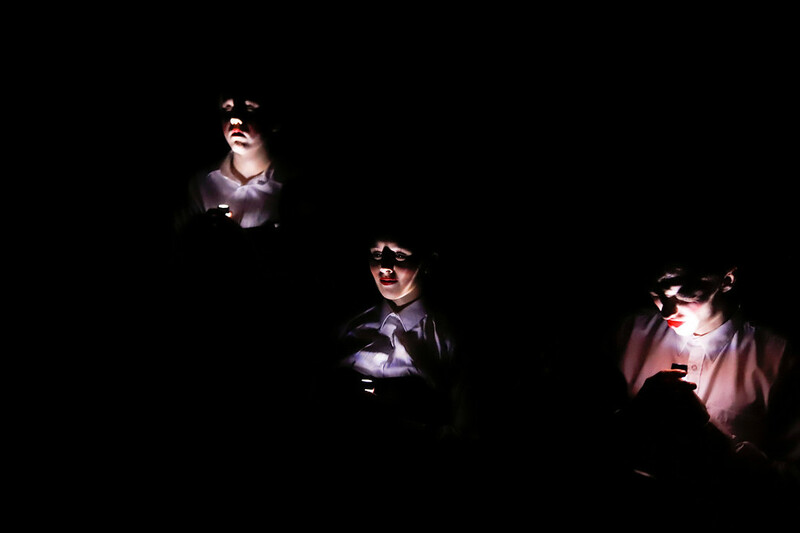 The playing with theatrical and choreographed form naturally keeps the piece playful even in its darkest elements. 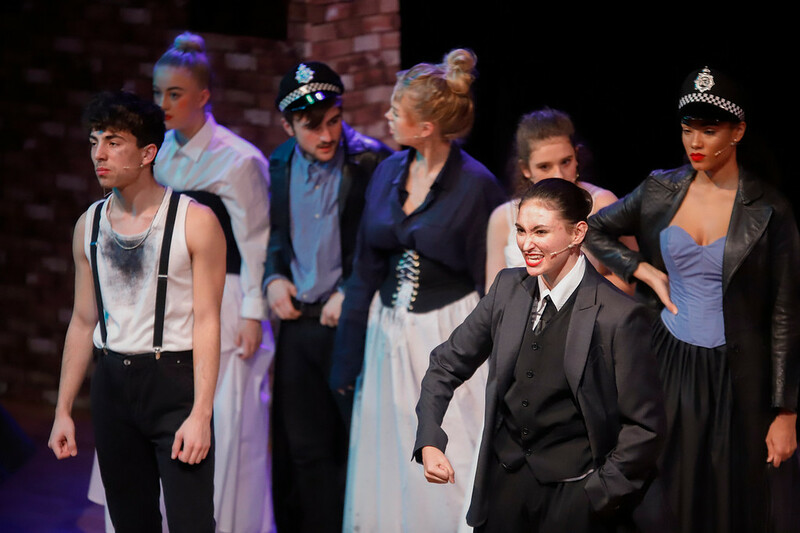 Overall, this student production of Urinetown the Musical shows a young student population making challenging and gender diversive choices that can only benefit their artistic careers and the present and future audiences that watch their work develop and influence others. Now this old reviewer needs to go to the loo. What do you mean there is a charge? Promo: Beauty and The Beast Pantomime adapted by Amanda Hall and Matthew John.